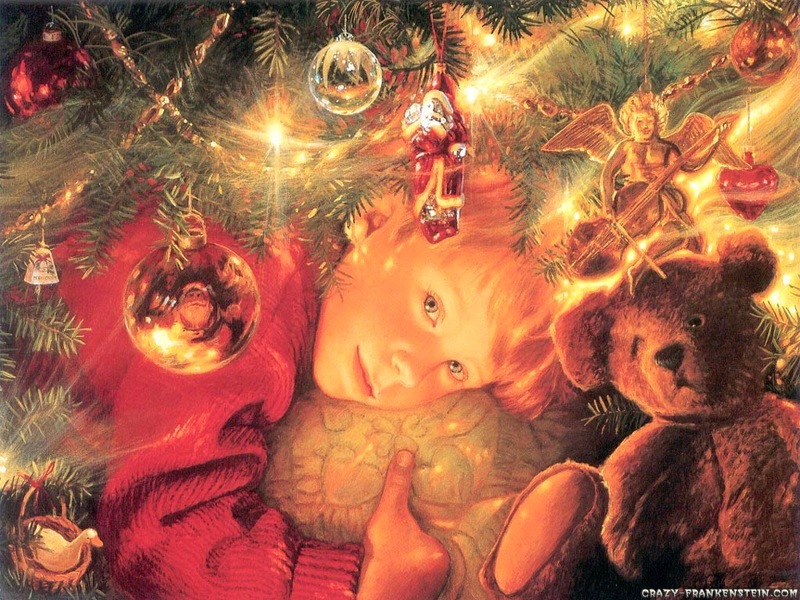 It is this time of year when memories come lightly tip toeing. There is a road that begins back in my childhood Christmases, and as I travel upon it, the faces of my father, mother and sisters each much younger than today, lit by holiday lights of years gone by, appear. Laughter, meals, gifts, me silently sitting by the glowing tree, alone with it's splendor, soaking up the sounds of Christmas music, conversation, the smell of spicy and buttery cookies. I've always, in the midst of the celebration, stolen away for a few moments to savor it all at it's apex, imprinting it upon my memory. Best Christmas ever? The year we had the Christmas eve blizzard. We always went to Midnight Mass and that year we had to walk because the roads remained unplowed. It was like magic, all five of us put on our winter wear and boots and out into the frozen air we went. 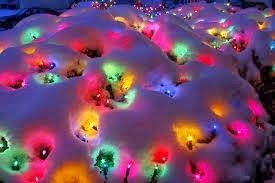 Christmas lights on the houses, the bulbs shining through layers of snow; the road disguised as a field or a lawn. 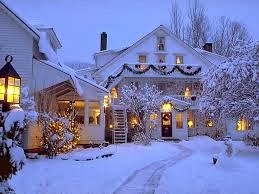 We walked down the center of the road through the pristine snow, leaving our footprints behind. It must have been a foot and a half deep. The wind wasn't blowing too much and our scarves covered our nose and mouth. What an adventure it was for 9 year old me. The snow muffled our voices and the silence was thick and glittery. The beauty of Midnight Mass with the candles and the lovely ladies choir, the warmth inside the old gothic style church, the stained glass windows shining from inside dully. Walking home I was barely able to stay awake and fell into bed as soon as I peeled off my outdoor things. Oh - before I went to bed I had to put the baby Jesus into his manger - after all, it was really Christmas morning. I, she in pajamas and a blanket, if it was cold, would venture forth in our car to look at Christmas light displays, all the while old English Christmas music wrapping itself around my ears and my heart. Ashley singing with the chorus, "Salvator mundi natus est" in her high childish voice, not knowing what she is saying, but singing it with relish. It is astounding to me, as it is to everyone who finds themselves having aged, that all these events are behind me. My daughter is nearly 30 years old - how could that be? Why - I'm really still a child myself! My father is always somewhere in the midst of all my thoughts - how I miss him, how I remember his full throated laugh, his humor, his tall, handsome self. We are all really still children inside. Our souls and spirits don't age, just these bodies, which is quite a shock. After all, we imagine these bodies to be "us", don't we? I look in the mirror - that's me, right? Not really, just the eyes are the window to the soul. Everything else passes away and we are left as children again, as youths again, with eternity, always-now to look forward to. Meanwhile, I'm going to turn on the Christmas lights, light a scented candle, and, cozy and comfy, go back in time and visit with all those lovely memories. Perhaps, in this very room, my grandparents and my father are remembering with me. I know, just recently I was thinking of a favorite memory and realized it had been over thirty years ago! My favorite Christmas memory is when we lived in Holland, Michigan and I was in their quaint Downtown section doing some Christmas shopping. It looked very village-like with the decorated windows and cobble streets (which were actually warmed underneath with pipes to keep ice from formong). Those large lake affect snow flakes were floating down, looking very "other world". Christmas music was playing in the distance. I knew magic was happening right then and there. Ha! How wonderful that you and I remember that walk in silence and pristine snow to midnight mass - also my favorite Christmas memory ever!! I also remember us walking single file through the street with the last wisps of snow still falling on us. I still remember the glistening droplets on dad's shoulders as he walked first in line. I remember that clear echoey silence that's always present after the snow has fallen, where you can hear a dog barking miles away breaking the peace and quiet of the blanketing snow. It was a truly magic moment and when we arrived at the church, the singing had already begun and in spite of the snow, the church was packed! Sigh . . . .